Done well content curation beats search for content distribution. While this sounds counter intuitive, it’s not. To rank for a specific search phrase requires keyword research, content creation, and time to appear and climb up in the listings. It may also require supporting paid search advertising. By contrast, content curation takes old fashion elbow grease. Translation: employee time. Mind you not all content curation is created equal. Bargain basement content curation won’t beat search. I’m talking about stripped down curation that attracts little distribution boost. This content curation adds little to the existing content beyond a ho-hum title and short, unmemorable commentary. Here are 3 ways that content curation beats search for content distribution. 1. Search only happens online. Sorry, but this is a biggie! Content curation can occur both online and offline. Great examples of offline content curation are The Week and conferences are a great example of offline content curation. 2. Search depends on visitors to seek the word(s) for which you’ve optimized. 15% of daily searches on Google are new (or 50 million searches). This means they’ve never been queried before. Content curation leverages the power of influencers plus quality content on reputable media platforms. 3. Search uses social signals. The strength of your content’s social acceptance has an impact on its ranking. 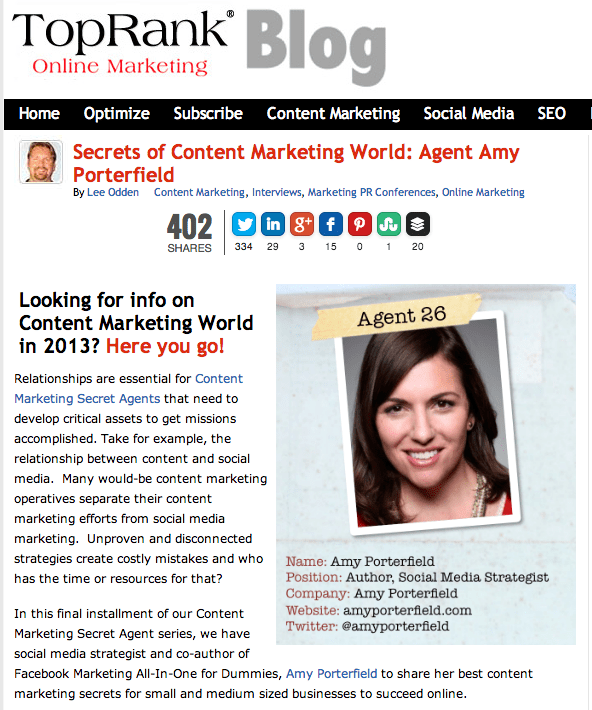 Social content and social sharing are baked into good content curation. As a result, participants have a vested interest in sharing the content because it makes them look good. 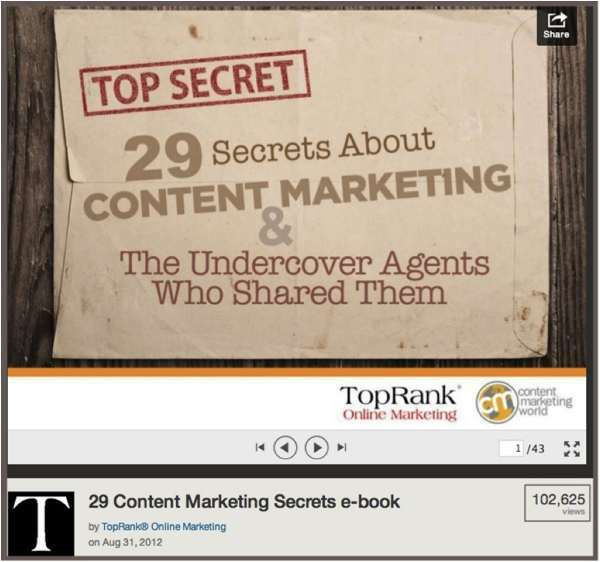 Here’s how to curate content that beats search (almost) every time. 1. Build a monster list. The bigger your roundup the better. Ian Cleary did this with his 53-person roundup post for the best WordPress plugins. Note Ian took this 1 step further but compiling information from the roundup and creating a great visual containing tiles of everyone’s photo. Talk about ego-bait. 2. Develop stellar roundup posts. (This is my personal favorite. BTW-It’s why Andy Crestodina thinks I’m the Queen of Content Curation!) The more people and bigger their audiences, the more attention you’ll attract. Share content by high profile people with large followings. While the person you’re trying to reach may not pay attention, his followers will. (Note how I did this in Point #2.) If you choose, you can create this highly magnetic form of social content and enjoy the expanded reach without contacting the big names you’ve included. Barry Feldman did this with his infographic. In addition to creating buzz on Convince and Convert, there was a long conversation on Facebook. 4. Craft attention grabbing headlines. 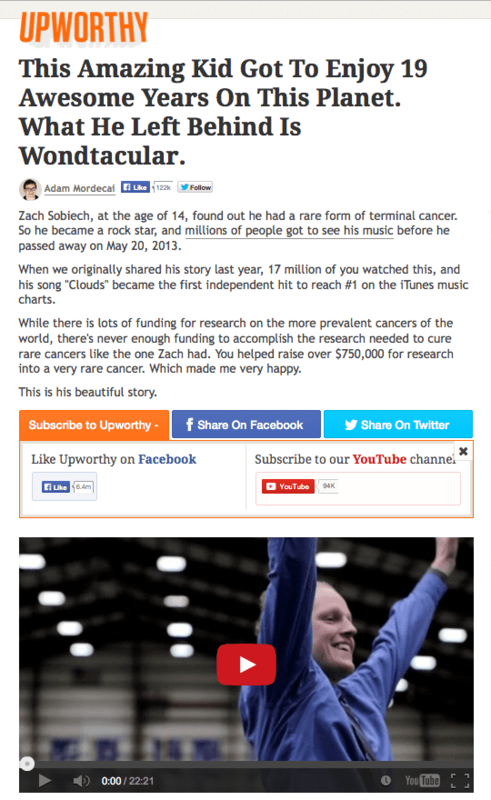 Upworthy has perfected this approach. Don’t take my word for it. Adam Mordecai recast the title as “This Amazing Kid Got To Enjoy 19 Awesome Years On This Planet. What He Left Behind Is Wondtacular.” With the new title, the video attracted 17 million viewers, made the song go #1 on iTunes and raised $750,000 for cancer research. 5. Add original input to provide context for readers. Ian Cleary went beyond the usual text introduction and conclusion. He incorporated a visual aggregating the information to create new content. 6. Think like a plastic surgeon. Make the person whose content you’re sharing look good. Enhance the content with amazing graphics. 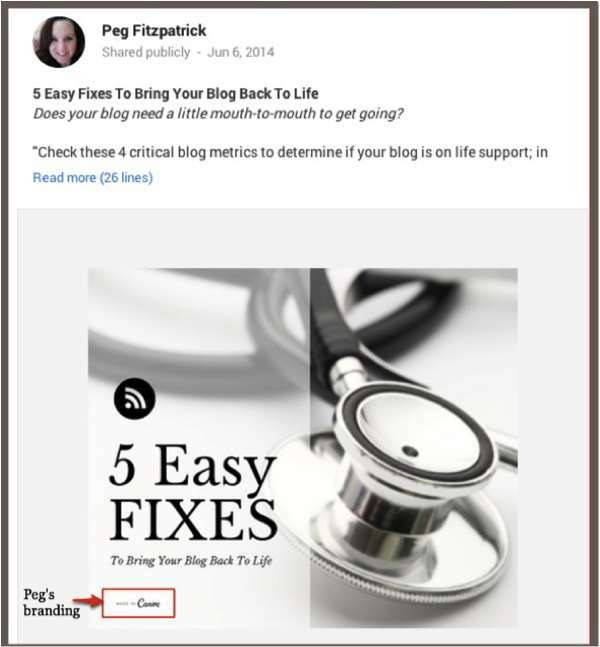 Canva’s Peg Fitzpatrick is the master of this technique. 7. Borrow someone else’s platform. Don’t just think of content curation as a way to fill you content marketing editorial calendar. You get more bang for your work if you publish it on a bigger media entity. This doesn’t mean sharing it on Facebook or Twitter if you’ve got only got 50 followers. Instead, craft the best roundup post ever and publish it elsewhere. Barry Feldman did this with his infographic on Convince and Convert. 8. Use more than one content format. Don’t limit yourself to plain text. It doesn’t grab people’s attention. Don’t stuff your article with “I Can Haz Cat photos.” Rather add quality. By utilizing other formats, you extend your reach beyond just Google. You get extra points (or at least views) if you use video and post it on YouTube and/or presentations and post them on Slideshare. Lee Odden has perfected this option. Note that over time this presentation has garnered over 100,000 views. 9. Create more than 1 piece of content from each curation effort. There are a couple of ways to accomplish this. Use each effort to collect content for different articles. I’ve done this. The upside is that it’s more efficient and the downside is that it’s more work for participants, decreasing your response rate. Gather information for different presentations. Lee Odden has done this with his conference related presentations. In addition to a SlideShare, he has 1 or more articles on his blog. This article received an additional 400 shares. 10. Incorporate a contextually relevant call-to-action (or CTA). The goal of creating a stellar piece of content curation is to attract a lot of attention. Utilize that attention to achieve a specific goal. Ian Cleary did this well with his roundup post. He included a link to Optin Skin just below his graphic of the results. Unlike search results, content curation delivers stellar content that keeps getting shared and distributed across owned, social, and third party media. Further, all of the content curation’s related social signals help the content to rank higher in appropriate searches. What’s your opinion on the content curation versus search debate? 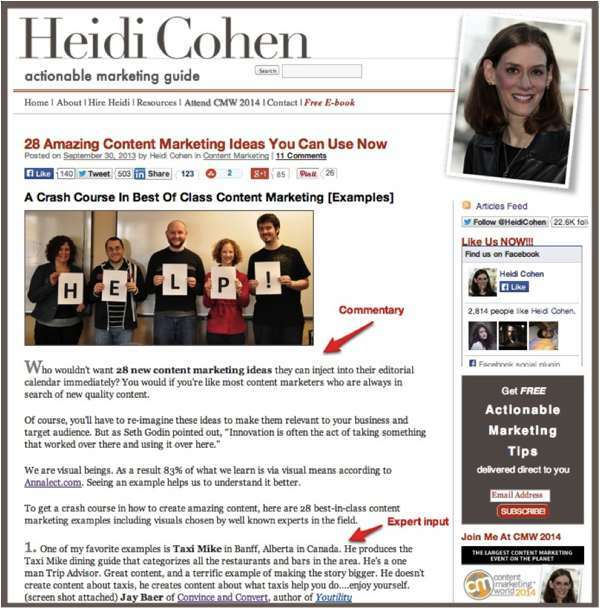 Heidi Cohen is Chief Content Officer of Actionable Marketing Guide. You can find her on Google+ and Twitter. 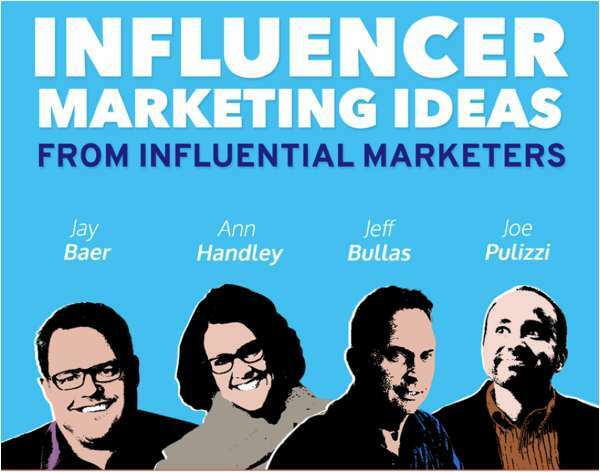 Mashups are very effective if and when influencer marketing is your anchor. Feedly and Buzzsumo and Scoop.it let’s you quickly find and share socially “ripe” content that has the potential to go viral and do it quicker and w/ more frequency.